Failover clustering is a Windows Server feature that enables you to group multiple servers together into a fault-tolerant cluster to increase availability and scalability of applications and services such as Scale-Out File Server, Hyper-V and Microsoft SQL Server. 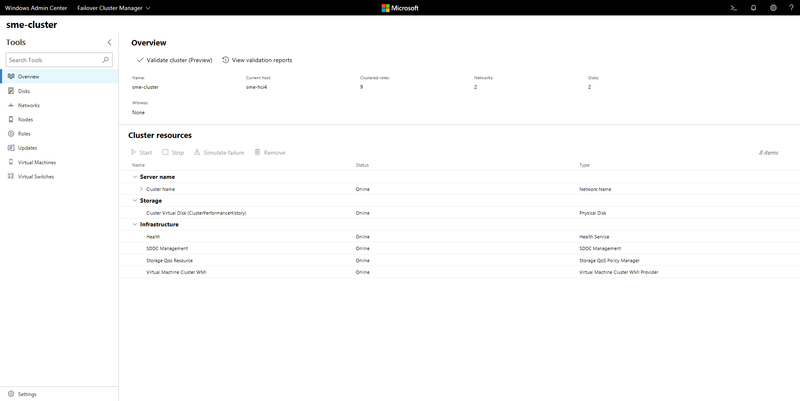 While you can manage failover cluster nodes as individual servers by adding them as Server connections in Windows Admin Center, you can also add them as Failover clusters to view and manage cluster resources, storage, network, nodes, roles, virtual machines and virtual switches. Choose to add a Failover Connection. Type the name of the cluster and, if prompted, the credentials to use. You will have the option to add the cluster nodes as individual server connections in Windows Admin Center. The cluster will be added to your connection list on the Overview page. Click it to connect to the cluster. You can also manage hyper-converged clustered by adding the cluster as a Hyper-Converged Cluster connection in Windows Admin Center.